A new painting depicting the moment Tom Morris Senior teed off in the first ever Open Championship was recently unveiled at The British Golf Museum in St Andrews. 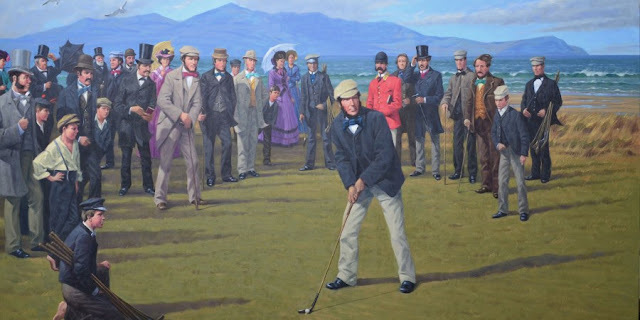 The artwork also features Willie Park Senior, who became the first Champion Golfer of the Year, looking on as Morris hits his opening drive at Prestwick Golf Club in Ayrshire on October 17, 1860. Professor David Purdie, who led the project to create the painting, gave a public talk about the great lengths they had taken to ensure the painting accurately depicted the historic scene. “It has never been seen before because no photographer or artist was present at the time,” explains Professor Purdie. The artist, Peter Munro, was also in attendance and spoke about taking on the unusual project. “It’s probably the most challenging painting I have ever done,” said Mr Munro. “I’ve painted portraits before but not of people from 160 years ago, which has its own challenges. Angela Howe, Museum and Heritage Director, British Golf Museum, explained the significance of the painting in educating the public about the birthplace of The Open. “It’s possibly a little-known fact that Prestwick hosted the first 12 Open Championships; in a lot of people’s minds, it’s St Andrews.